The Cactus Garden in Guatiza, in the northern part of Lanzarote, is yet another facility that can be traced back to Cesár Manrique. In a crater-like atmosphere one can examine everything that has thorns and that needs little water, even under a southern sun. But a visit here is worthwhile, not only because of the cacti, but because the place is very beautifully designed. 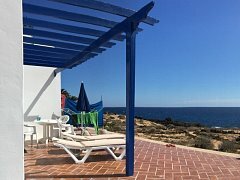 It is an island that invites you to stay a while, and of course there is also a little restaurant where one can recover from the exertions of an excursion. 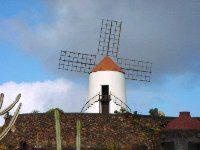 Perched high above the Cactus Garden there is a restored windmill (see photo). One can enter it and study the century-old technology of a milling operation that still functions today, and sometimes, if one is lucky, one can even see it in action. The cacti that grow in the garden all come from the neighboring village of Mala and were grown there by a private citizen. His garden is not accessible to the public, but from the village street one can still admire his magnificent cactus garden. The northern part of the island, especially around Guatiza and Mala, has a great tradition involving cacti. As far as the eye can see, one can here admire Tuneras (opuntias), which are used by the locals to raise conchinilla (lice). They were previously used to make the red coloring in Campari and also for example in lipstick. Still today, enormous areas are covered by cacti that are full of lice that produce a red color if you rub them in your hand.